Bim is CEO and owner of The Santon Group. Bim was a founder and CEO of Raven Mount plc, a co-founder of Raven Russia Limited, which Bim helped to list on AIM raising over £450m, and CEO of the external Fund Manager to that company. He was Chairman and a co-founder of Audley, an assisted living business operating retirement villages. In the 1990s, Bim was MD of the UK Operations of the publicly listed Australian developer Hudson Conway and represented their 50% interest as a director of 5,000 pub unit strong The Courage Pub Company plc. Bim is currently Chairman of the Audit Committee and Non-Executive Director of AEW REIT UK plc which listed on the LSE in May 2015. Bim qualified as a Chartered Accountant with KPMG Peat Marwick in London where Bim had a number of property clients. Following qualification he was appointed Secretary of KPMG Property & Construction Group. Subsequently in 1989 he was invited to become Financial Director and then Managing Director of the UK operations of Hudson Conway, a listed Australian property developer and one of his major clients. He was also a Director of The Courage Pub Company plc, which owned the 5,000 strong Courage Pub Estate, representing Hudson Conway’s 50% interest in the joint venture with Fosters. Bim was subsequently responsible for the winding-up of the UK operations and returning over £150m to shareholders. Bim has been a major owner in The Santon Group since 1994 (when it was still known as The Raven Group) and became the sole owner in 2009. He was co-founder of Raven Mount plc, which was principally funded by The Santon Group prior to its takeover of Swan Hill Group plc (in exchange for shares). Bim was Managing Director and a major shareholder in Raven Property Holdings plc, the residential arm of the group, prior to its acquisition in December 2004 by Raven Mount plc for a consideration of £40m, all payable in shares. Subsequent to the acquisition by Raven Mount plc, he became the second largest shareholder in Raven Mount plc and became its Chief Executive and led the process of re-invention of the group. During his tenure as CEO of Raven Mount plc from 2004 to 2009 Bim was responsible for the setting up and flotation of Raven Russia Limited, the Guernsey registered AIM listed investor and developer which raised £153m in July 2005 from institutional investors (including £10m from Raven Mount itself) and a further £310m in May 2006. Raven Russia was externally managed by Raven Mount. Bim led the negotiations for the disposal of the manager in 2008 to Raven Russia at a transaction value of just under £100m when the transaction was entered into. He was also the main negotiator in the transaction that led to the disposal of Raven Mount to Raven Russia in 2009. Bim was instrumental in the setting up of Raven Mount’s Assisted Living subsidiary, Audley (of which he was the Chairman), and also with its disposal in October 2008. Bim was a Director of the Swan Hill Pension Trust Limited which had 1400 pensioners and deferred pensioners. He negotiated the buy-out of the £72 million pension scheme by Pension Insurance Corporation which concluded in May 2008. Bim is an Angel Investor and has made investments in a number of diverse businesses. Current investments include YouHome (online estate agency), Genus Law (legal services), Bonnie Gull Seafood Shack (restaurants) and Health Fabric (telehealth solution to suppport integrated care, self management and better outcomes for patients), Premier Asset Management Group Limited (fund managers), RefurbThat.com (Microsoft authorised reseller) and Endura (branded cycle apparel design and manufacturer). Bim was previously a Non-Executive Director of Oriel Securities Limited (stockbrokers and corporate finance house) and a major investor prior to its takeover by Stifel. Bim won the Mary Huskinson Scholarship to attend university. He graduated from the London School of Economics where he obtained an Honours Degree in Economics. He subsequently obtained an MBA with distinction from City University Business School (now known as CASS Business School) where he graduated joint top of his class. His group also won the Tallow Chandler Prize for the best dissertation. Bim is a Fellow of the Institute of Directors, a Fellow of the Institute of Chartered Accountants and a Fellow of the Chartered Management Institute. 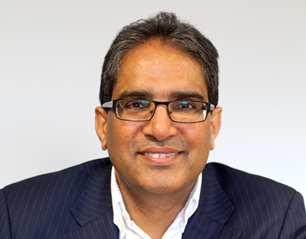 Bim is the founder and Chairman and primary donor to The Sandhu Charitable Foundation which had audited net assets of over £5m as at 31 March, 2014. The Foundation has made combined donations of over £1m to over 75 charities. Bim is an Ambassador for the Magic Bus Charity.